BUJUMBURA, BURUNDI (ANS – September 29, 2016) – A Christian organization based in Burundi, officially the Republic of Burundi, a landlocked country in the African Great Lakes region of East Africa, bordered by Rwanda to the north, Tanzania to the east and south, and the Democratic Republic of the Congo to the west, has issued an urgent appeal to help orphans as they return to school. It comes from Deogratias Niyonzima, President and Legal Representative of Christian Community Development of Burundi (CCD BURUNDI), which was created in 2001 and registered by the Government of Burundi on February 6, 2004, with the registration number of 530/73/2004. “At this time in Burundi, children return to school, and in our organization, we have many orphans who are in a great need of help. They need food, education help, medical treatment and clothing. Please pray for them so that their needs be met in full. Any donation will be highly welcome,” he told ANS. “First of all, we have the Bible, the bread of life and ‘CCD Burundi’ feeds the people with God’s Word to help bring about spiritual transformation. Secondly, we educate people and finds ways and means to develop poor people physically, economically, socially and emotionally. “We accomplish this through evangelism, education, children’s ministry, care (counselling and support), HIV/AIDS aid, humanitarian aid, peace and reconciliation, emergency aid, health, and community development projects (such as health centers, hospitals, house reconstruction, building of schools, agriculture, farming, water and sanitation, job creation, income generating activities, vocational education and training, small and medium workshops, micro financing and macro enterprises.” (See http://ccdburundi.org.uk/projects/). He went on to say that “CCD Burundi” has helped refugees and returnees, orphans in Burundi with food and educational support, and provided emergency relief in Burundi, Kenya and Japan after the Tsunami and earthquake there. 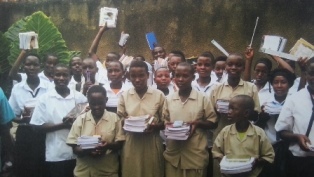 For more information, please visit their website www.ccdburundi.org.uk. If you would like more information on how you can help, please e-mail Deogratias Niyonzima at gdeniy@gmail.com or at ccdburundi@gmail.com. His phone numbers are (office) +257-2227-7724 or (mobile), +257-7997-9036. Photo captions: 1) Deogratias giving food to street children. 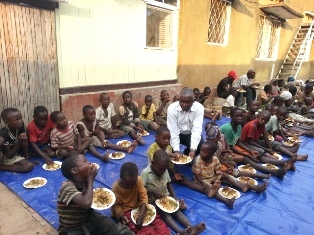 2) Some of the Burundi orphans who need help at this time. 3) Deogratias Niyonzima preaching in Hong Kong. 4) Norma and Dan Wooding. About the writer: Dan Wooding, 75, is an award-winning winning author, broadcaster and journalist who was born in Nigeria of British missionary parents, and is now living in Southern California with his wife Norma, to whom he has been married for more than 53 years. They have two sons, Andrew and Peter, and six grandchildren, who all live in the UK. Dan is the founder and international director of the ASSIST News Service (ANS). He is the author of some 45 books, and has been a full-time journalist since 1968. Dan also has a weekly radio show and two TV shows all based in Southern California. 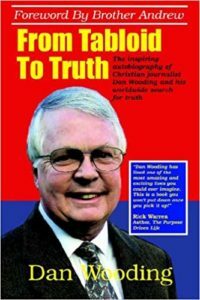 Wooding became a full-time journalist in 1968, working for the Billy Graham-owned UK newspaper, The Christian, and later worked as a writer for Mr. Graham during his overseas crusades in Moscow, Russia; Essen, Germany; and San Juan, Puerto Rico.